Nylon, also known as polyamide, is one of the most popular and versatile 3D printing materials on the market. A synthetic polymer, nylon is abrasion resistant, tough and possesses greater strength and durability than both ABS and PLA thermoplastics. 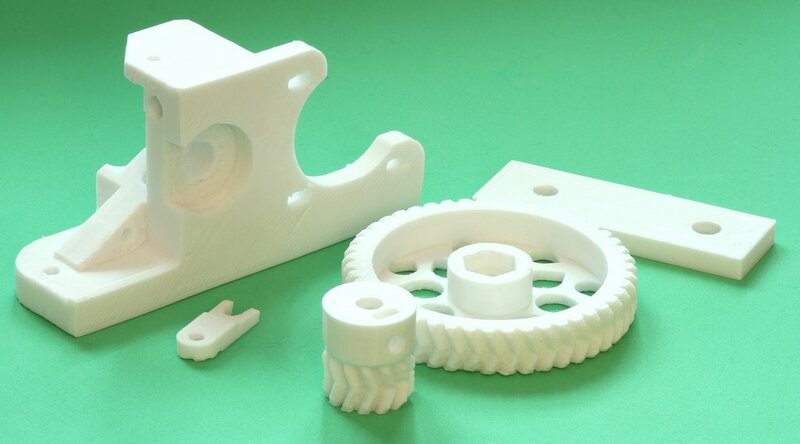 These properties make nylon an ideal choice for a wide range of 3D printing applications. Today’s tutorial will take a look at the benefits of nylon 3D printing, as well as potential applications. We’ll also explore which 3D printing technologies work best with nylon and provide tips on how to achieve great printing results with nylon filaments. Why 3D print with nylon? Ideal for prototypes and functional parts like gears and tools, nylon can be reinforced with carbon-fibre or glass-fibre, resulting in lightweight parts with excellent mechanical properties. Compared to ABS, however, nylon is not particularly stiff. Thus, if your part requires stiffness, you will have to consider reinforcing your part with additional material. Nylon offers a great rigidity to flexibility ratio. This means that your part will be flexible when printed with thin walls, and rigid when printed with thicker walls. This lends itself well to producing components like living hinges with rigid parts and flexible joints. Since parts printed in nylon typically have a good surface finish, less post-processing is required. Combined with powder-bed technologies like SLS and Multi Jet Fusion, 3D printing with nylon can be used to create moving and interlocking parts. This eliminates the need to assemble individually printed components, and enables highly complex objects to be produced more quickly. As nylon is hydroscopic, meaning that it absorbs liquids, parts can easily be coloured in a dye bath following production. Nylon and polyamide-based composites work best with powder-bed 3D printing technologies like Selective Laser Sintering (SLS) and Multi Jet Fusion (MJF), and many different types are available on the market. Nylon materials can also come in the form of filaments for FDM 3D printers. However, due to high printing temperatures and warping issues, it can be more difficult to use nylon filaments with FDM. Nylon powders are widely used in the SLS printing process, with Polyamide 11 (PA11) and Polyamide 12 (PA12) being the two most commonly used polyamides. PA11 has great UV and impact resistance, while PA12 offers greater strength and stiffness. There is also a wide range of composites like glass, carbon-fibre and aluminium-reinforced polyamides, which offer even more enhanced mechanical properties. Currently, SLS is the most reliable technology for 3D printing with nylon, although Multi Jet Fusion technology offers higher speed and better dimensional accuracy. HP’s Multi Jet Fusion technology supports a range of nylon 3D printing materials, namely PA11, PA12 and HP 3D High Reusability PA 12 Glass Beads (40% glass bead filled polyamide material). Nylon powders for MJF are highly reusable, as surplus powder (up to 70%) can be recycled and reintroduced into the printing process without compromising the mechanical properties of your part. While FDM can be used for nylon 3D printing, nylon requires printing temperatures higher than many FDM extruders can manage. Compared to SLS and MJF, nylon filaments for FDM are not as as widely used for industrial applications, but there are nonetheless several FDM 3D printers on the market that are optimised for this use case. Markforged, for example, offers its proprietary Onyx material. Onyx, a nylon and micro-carbon fibre composite, produces tough, heat-tolerant parts suitable for end use applications and is said to be 1.4 times stronger and stiffer than ABS parts. Since nylon absorbs moisture, humid nylon filaments can lead to undesired results such as bad layer adhesion and surface roughness. That’s why it’s crucial to store nylon filaments in dry, airtight containers and ensure that the material is dry before printing. It’s also good practice to dry nylon filament in oven at 70°C to 80°C for four to six hours. With the average printing temperatures for nylon filaments being 240 degrees and above, some FDM 3D printers may be unsuitable for such high temperatures. It’s therefore advisable to verify the maximum temperature of the extruder on your FDM printer before using nylon filaments. Since nylon is prone to warping, it’s highly recommended to preheat the printing platform to prevent this. For SLS and MJF 3D printing, your nylon parts will require at least 1 mm wall thickness. When designing living hinges, ensure that the minimum wall thickness is 0.3 mm and 0.5 mm for SLS and MJF respectively. It’s highly recommended not to design large and flat parts when working with nylon in powder-bed processes because of high chances of warping. Since nylon allows moving and interlocking parts to be created, it’s crucial to ensure that spacing between parts which are printed together is at least 0.5 mm. It’s advisable to remove nylon powder trapped inside your part, especially for parts with walls thicker than 20 mm. To save material and avoid deformations, ensure that at least two escape holes are factored into the design to help easily remove powder after printing. Nylon is the perfect choice for various applications, including repetitive snap fits, living hinges and gears. Both the aerospace and automotive industry have embraced the flexibilities of nylon to produce customised tooling, jigs and fixtures, as well as prototypes for interior panels, low-heat air-intake components and antenna covers. Nylon parts can also be found in aircrafts: for example, American company, Metro Aerospace, has recently 3D printed glass-filled nylon microvanes designed to reduce drag. Through this 3D printing process, Metro Aerospace has been able to ensure the consistency of its flight-grade components, making it easier to achieve the FAA approval. In the medical sector, nylon can be used for prototyping and creating educational anatomical models, in addition to producing medical end-use parts. BASF’s Ultramid polymide has recently been used to produce customised 3D-printed prosthetic sockets. The polyamide, reinforced with carbon fibre, ensured that the prosthetic remained strong and lightweight. It’s not only in industrial sectors that nylon 3D printing is being used. Rapidly increasing its use of 3D printing, the consumer goods industry is also putting nylon to good use. From phone cases to customisable eyewear, nylon provides a flexible choice across a range of applications. A recent case is Chanel’s 3D-printed mascara brushes, created with polyamide powder, using SLS technology. Nylon 3D printing presents a vast range of benefits for industrial designers and engineers, creating parts with good mechanical properties suitable both for functional prototyping and end use.While SLS is currently the most common technology used to print nylon parts, technological and material advancements mean that other technologies are quickly catching up. For example, by encouraging collaboration, HP’s Open Platform aims to push the adoption of nylon 3D printing with MJF technology. On the FDM side, nylon filaments suited to the technology are also under constant improvement. Metal 3D Printing: What is Direct Energy Deposition?